Scour the coast of the Isle of Wight and you will come across a wide variety of seaside towns and villages, including some famous resorts such as Ryde, Sandown and Ventnor. One interesting fact about the island’s towns with good sandy beaches is that each is unique in character. Ryde is in the north if the island and one of the nearest to the ferry and arrival point for tourists to the Isle of Wight. It has a long stretch of sandy beach, plenty of holiday accommodation and eateries plus entertainment to keep families amused at all hours. It could be described as the most developed and commercial of the IOW seaside towns. Ventnor is the opposite, southern point of the island is a small quaint family resort with the requisite sandy beach, a fishing harbour, beach huts and a certain amount of charm. The beach contains shingle streaks, but has enough sand for sand castles. It also shelves gently into the sea – perfect for little ones paddling and jumping the waves. Sandown Beach, along the east coast of the Isle of Wight is the longest on the island and arguably the best. Deep, with good quality sand, this beach provides plenty of space for visitors and is backed by a concrete esplanade for cycling and walking. There is a pier in Sandown and a wide choice of tourist attractions including a dinosaur visitor centre. At the north end of Sandown beach is Yaverland, which has a Blue Flag beach and cliffs beyond. A large car park welcomes visitors and there are toilets and a café. Travelling north from Yaverland is Calver Down, a chalk cliff that meets the sea with a narrow strip of beach. Rows of dinghies rest on the sand and shingle beach for the summer season. There are walks over the grassy downs with wonderful views of the sea. The narrow sections of beach are more suited to dog walking rather than families with buckets and spades. Bembridge Beach is a little further north. This again is a superb beach for walking dogs. Bright yellow evening primrose grows here in abundance on the edge of the sands. There is marram grass and lots of places to sit should anyone wish to. Boat yards and marinas line the side close to the road; it is more of a working and functional coastal location rather than seaside holidays, although worth a look just for the wild flowers. The Isle of Wight is one of Britain’s premier dogs-welcome holiday destinations. There are various beaches where dogs are allowed all year round. Sandown is an amazing beach considering the quality of the sand. It must be wonderful for dog owning families to enjoy a seaside break together. UK seaside cottage holidays - lovely beaches with nearby self-catering holiday places to stay around Britain, including the south coast of England. Being a relatively small island, the Isle of Wight is edged by cliffs, coves and beaches. Find holiday cottages overlooking the sea, in small seaside towns or within a short distance. 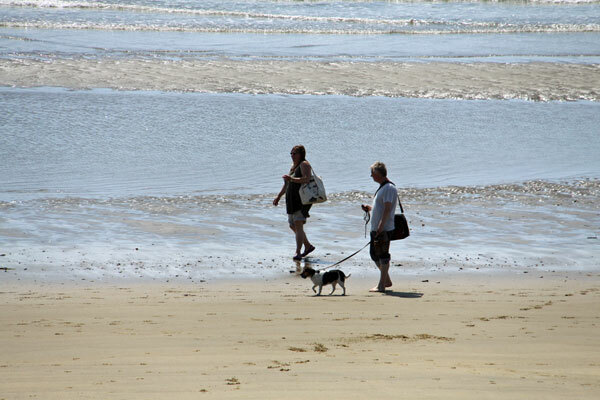 Some of the very best beaches that allow dogs all year round are on the Isle of Wight. 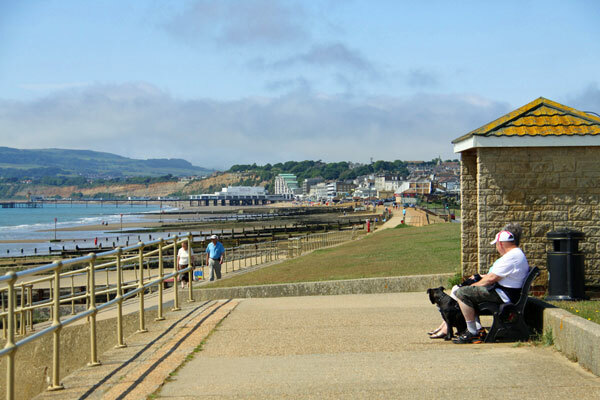 Sandown is a long sandy beach, bordered by an esplanade - perfect for dog walking. 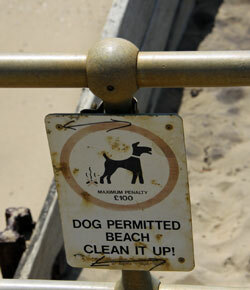 Dogs are also permitted on the beach.